Blog Quick Quotes: Today is a Perfect Day! Hello and welcome! 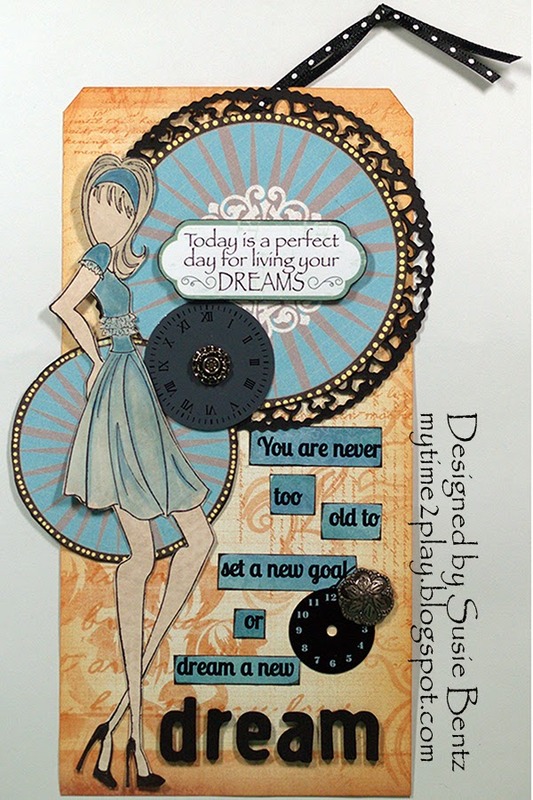 Susie here to sharing a tag I created using a mix of products from Quick Quotes! Lately I have become obsessed with tags. I much prefer making them to cards and they serve the same purpose. I think this would look great on a birthday present! The background tag is cut from Sheer Joy 700 and the edges are inked with Mango Mai Tai PowderPuff Chalking Ink. I am sure you recognize those fabulous graphic circles from Dream Big collection! I backed the largest circle with a black doily and then placed the sentiment, which came from the Sheer Joy Diecut Sticker sheet, in the center on pop dots to give it some dimension. I colored the stamped image with PowderPuff Chalking Inks. I used Blue Moon for her dress and Feather Gray for her hair - so she would look like me! The strip journaling on the tag is cut from the Serendipity Words and Phrases Strip. I inked the edges with Midnight Confessions. I added a few bits and pieces from my stash to finish it off.